0.500" C.A. system. Binocular head with inter-ocular eyepiece adjustment permit real-time viewing of workpiece. Independent course and fine focus adjustment. Four-turret microscope objective base. 1.0" focus travel. 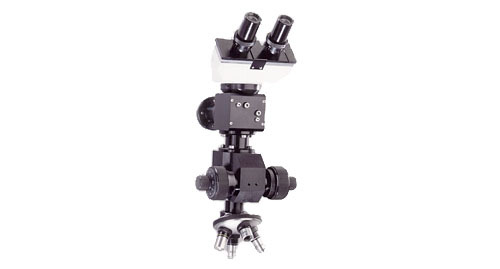 Kinematic 90º bending mirror assembly with KG3 protective filter for the binocular head. Mounts directly to front bezel of laser.